Meg’s practice focuses on environmental and land use litigation, regulatory compliance counseling, and environmental due diligence of development projects. Meg has challenged and defended projects under the New York State Environmental Quality Review Act and represented potentially responsible parties in CERCLA proceedings. She has experience with matters arising under a variety of federal environmental laws, including the Clean Air Act, the Clean Water Act, the Resource Conservation and Recovery Act, and the National Environmental Policy Act. 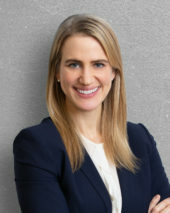 Prior to joining the firm in 2018, Meg was an Assistant Corporation Counsel in the Environmental Law Division of the New York City Law Department. During her time at the City of New York, she represented the City and its agencies in federal and state environmental litigation, and assisted City agencies with environmental regulatory compliance. Meg is a graduate of Harvard Law School, where she served as Editor-in-Chief of the Harvard Environmental Law Review and was a student attorney for the Emmett Environmental Law & Policy Clinic. Before law school, Meg worked for an environmental nonprofit in New Delhi, India.